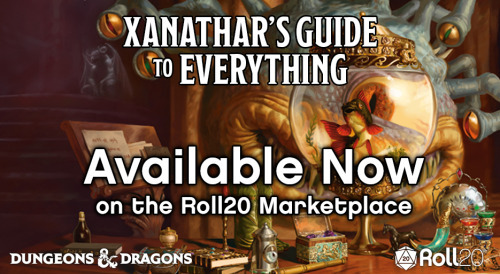 Roll20′s Got Everything – Including Xanathar’s Guide to Everything! Over twenty-five new subclasses for the character classes in the Player’s Handbook, including the Cavalier for the fighter, the Circle of Dreams for the druid, the Horizon Walker for the ranger, the Inquisitive for the rogue, and many more. All of this is integrated directly into the Roll20 Charactermancer, which now supports leveling. Dozens of new spells to drag and drop directly onto your character sheet. A collection of racial feats, and a system to give your character a randomized backstory. Underworld Speculation, an introductory adventure for 3rd level characters, converted in its entirety to the Roll20 tabletop, with support for Dynamic Lighting and Advanced Fog of War. Comes with seven ready-to-play characters, each highlighting a Xanathar’s Guide to Everything subclass. Bonus Character Asset Pack, including tokens and art handouts for you to drag and drop onto the table or any of your character sheets. A variety of tools that provide Dungeon Masters fresh ways to use traps, magic items, downtime activities, and more – all designed to enhance a D&D campaign and push it in new directions. up Xanathar’s Guide to Everything for $29.99! LLC. ©2018 Wizards. All Rights Reserved.